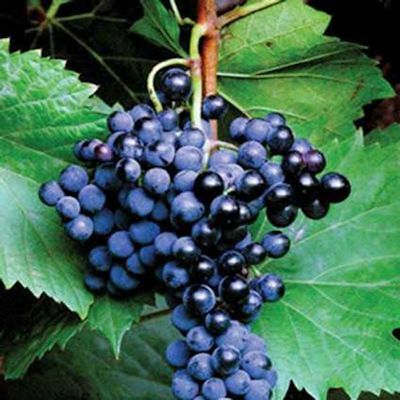 Frontenac is a French-American hybrid grapevine that is a result of research and cross-breeding by the University of Minnesota . It was grown from a crossing of the complex interspecific hybrid Landot 4511 and a very cold hardy selection of Vitis riparia . The parent grape, Frontenac, was introduced by the University of Minnesota in 1996. This dark blue-fruited cultivar originated from a cross of Vitis riparia x Landot 4511. On its website, the University describes the arrival of the blanc variety as ‘an exciting new development for cold climate growers” because of Frontenac’s cold tolerance and disease resistance. Frontenac Gris is a white wine version of Frontenac, introduced in 2003. 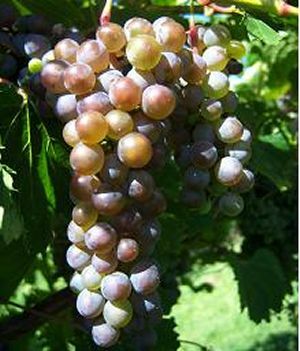 It started as a single bud mutation of Frontenac, yielding gray (thus named gris) fruit and amber-colored juice. 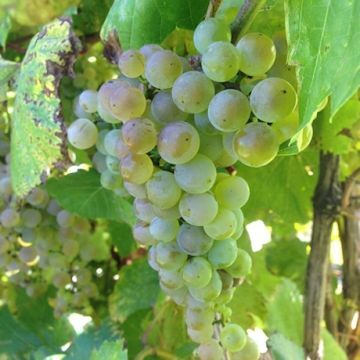 Frontenac blanc, a mutation of Frontenac Gris, is the latest member of the Frontenac grape family. Viticulture experts say the variety was first observed in Quebec during 2005 and that the mutation was probably taking place at several Canadian and Minnesota vineyards at roughly the same time. Frontenac blanc was officially introduced in 2012 from white fruited mutations found in both Fronenac and Frontenac Gris vines in Minnesota and Canada. Frontenac Gris (pictured) makes a white wine with a peach and tropical fruit flavour Vignoble Bouche-Art,Vignoble Carone, Les Petits Cailloux and Little Red Barn winery. Frontenac Gris is suitable for making dry white wines, sparkling wines and icewines. Introduced in Quebec in 2008, it contains high levels of sugar and acidity. Frontenac Gris wines typically present peach aromas. Produces include Vignoble Gagliano, Domaine Le Grand Saint-Charles and Coteau Rougemont. Frontenac can also be found in New Brunswick. Two good producer are Dunham's Run Estate Winery and Richibucto River Wine Estate. Recently Frontenac is catching on in Nova Scotia where warm fall evenings drop acidity. These grapes are doing very well in Planters Ridge's Tidal Bay. Shrugging Doctor Brewing Company was incorporated in April 2016 by two Winnipeggers; Zach Isaacs and Willows Christopher are attempting to grow Frontenac in Manitoba. Frontenac -1996 - Vigorous and very disease resistant. Wine has flavours of cherry and plum. Can be high in acidity. Frontenac Gris - 2003 Vigorous and very disease resistant. Wine has a characteristic peach flavour. Can be high in acidity. Frontenac Blanc -2012 - White-fruited sports of Frontenac and Frontenac Gris with earlier harvest date. Introduced in 1995, Frontenac is the first in a series of new wine grape varieties developed by the University of Minnesota for Upper Midwest conditions. A cross of V. riparia 89 with the French hybrid Landot 4511, Frontenac combines many of the best characteristics of each parent. Frontenac is a very cold hardy vine and has borne a full crop after temperatures as low as -30 F. It is also a very disease resistant variety with good resistance to powdery mildew and near-immunity to downy. Initially acids are high, but often drop dramatically late in the season. Fortunately, the pH does not often rise to dangerous levels. When grown in colder area the berries must be left on the vine long enough to mature fully. It produces only a moderate number of tendrils, which facilitates vine management.